It is an expensive business raising a child, so a stay-at-home dad must make sure he is getting all the financial help he is entitled to. Any boost to the family coffers will be a welcome one, and child benefit is the best place to start. Child benefit is a regular, tax-free payment made to anyone bringing up a child or young person. It is paid for each child that qualifies and is not affected by income or savings, so most people bringing up a child can get it. As of May 2008, child benefit was £20.30 per week for the eldest child and £13.40 per week for each additional child. Those raising a child under 16 are eligible, and in some instances the benefit is payable to those bringing up a young adult of up to 19 who is in full-time education or training. A househusband should claim child benefit as soon as his child is born. He can also claim if he adopts a child, if a child comes to live with him. Just fill in a claim form and submit the child’s birth or adoption certificate. New parents should receive a claim form from the hospital, or it can be completed online at the HM Revenue and Customs website. Child benefit can be paid into a building society, bank, National Savings or Post Office account that accepts direct payment and is paid every four weeks. It can be paid weekly to single parents and those on income support or income-based Jobseeker’s Allowance. For tax credit purposes, child benefit is not counted as income, but it can affect the amount of other benefits a family receives, including income support, income-based Jobseeker’s Allowance, pension credit, housing or Council Tax benefit and 50-plus employment credit. Another possible financial boost all househusbands should investigate is child tax credits. Ninety per cent of families with children get tax credits from the government and those raising at least one child may qualify. The amount of child tax credit a family receives depends on the household income - the lower the income, the more tax credit is payable. Other factors taken into account include the number of children and whether or not the family pays childcare or has a child with a disability. Those with partners must make a joint claim for tax credits, and the money will be paid to the child’s main carer. Tax credit payments are based on current personal circumstances and income from the previous tax year. When a new claim is made, payments will typically run from the date of the claim to the end of the tax year. Each year between April and June, HM Revenue and Customs will check on the claimant’s personal circumstances, confirm the income received in the tax year that has just ended and renew the claim. Tax credits are paid directly into a building society, bank, National Savings or Post Office account if it accepts direct payment, either weekly or every four weeks. 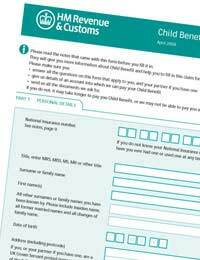 The easiest way to find out would be to use the the Turn 2 Us benefits calculator - you can input your own details and establish whether you're entitled to any benefits other than Child Benefit. Me and my partner are both working at the moment and are expecting our second child soon. We already have a little girl and a son from a previous relationship she had and already claim tax credits for those 2. I know we would get for new baby. We have been talking about one of giving up work my partner earns more than I do. Which would be best to give up work me or her? We can't advise on individual situations like this sorry. This is something you'd be better working out between you. Hi I am thinking of leaving my job and becoming a stsy at home dad but I am scared of what the Financial implications will be as I earn around £20,000 and my partner earns alot less if I am honest and for me its not having money to pay the bills and paying everything else like gas and electricity as we struggle now to pay everything. Hi I'm thinking of becoming a stay at home dad.i currently earn 18500 and my wife earns 52000.we have 2 kids already and 3rd is due in 6 months.my wage would only cover childcare.we don't get child allowance.